After making their mark as collaborative artists on Matt Fraction's Casanova over at Image, twin brothers Fábio Moon and Gabriel Bá have set their goals a bit higher with Daytripper, their new project for Vertigo. Assuming (and sharing) both the written and artistic responsibilities, the pair's first stab at a self-inclusive project is an ambitious affair. Through the eyes of Brás, a foreigner traveling through the less-touristy locales of rural Brazil, and his charismatic companion Jorge, the twin creators take their readers on a tour of both their homeland and the human experience. 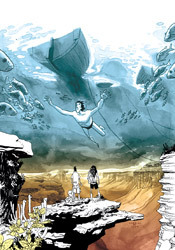 Daytripper's timeframe lazily moves forward and backward like the soft waves of the ocean. Last month we saw a flicker of the narrator's future, a foreboding prediction that saw Brás struggling to swallow his last breaths in a pool of his own blood. This month's focus slides backwards by a few years, traveling to a brighter time in his life and evaluating how his past actions and encounters indirectly led him to such a gloomy apparent demise. If you're looking for an up-tempo adventure, this won't suit your needs. Its focus is deeper than that, and although none of the narration explains it outright, the goal is a complete picture of the spirit behind Brás's physical mask. Whether or not the duo actually succeeds is up to the reader, and how much (s)he finds in common with that central figure. It's the issue's artwork, more than its storytelling, that's Daytripper's most captivating quality. The twins collaborate on each page, their combined efforts bringing out the best in each unique style and producing a unified vision that almost seems like it was created by a separate, third entity. Ever heard a duet that mixes the two singer's voices so expertly, their individual tones combine to produce a distinctly different voice? It's the same kind of effect here. The pair bring a flavor that's faintly reminiscent of David Lapham and Eduardo Risso; simplicity without the sacrifice of identity. The page is clean but detailed, easy to scan but also to get lost inside. They deliver an understanding of the architecture, population and general attitude of Brazil that wouldn't have felt authentic in the hands of another, enhancing the dreamy, otherworldly mood the series seems to strive for. Along the way they get a lot of help from colorist Dave Stewart, whose richly textured watercolors take the book's visuals to another level. Stewart stays out of the spotlight when the story's meant to steal the focus, but on the few instances its goal is to awe the reader with a spectacular glimpse into the local scenery, he jumps right to the forefront. Moon and Bá's compositions would do just fine on their own, but it's really Stewart's colors that make the sunset on the second page, or the underwater scene around the halfway point, so genuinely spectacular. This issue ends just as abruptly as the first, shocking us with another dead end road that leaves an array of questions unanswered, but in so doing ensures it'll stay alive in the audience's minds much longer than if it had been upfront with its resolutions. It's an absorbing adventure in personality, motivation and decision, not to mention a brief, authentic look at what sets Brazil apart from the rest of the world. The gorgeous artwork is the first thing you'll notice, but the story's haunting echoes will stay with you for the long run. Buy it.